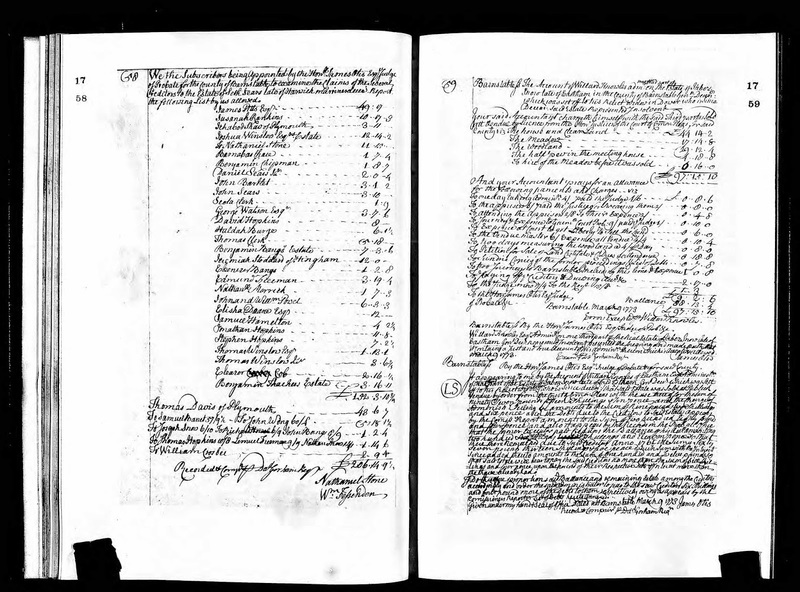 Genea-Musings: Amanuensis Monday - 1773 Probate Papers for Jabez Snow (1696-1760) Estate in Eastham, Mass. 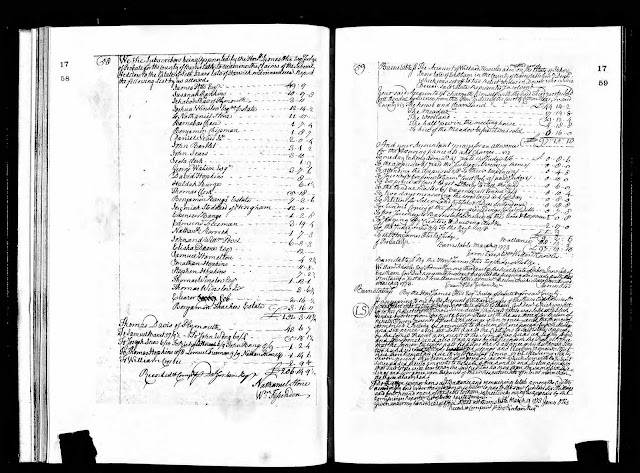 Amanuensis Monday - 1773 Probate Papers for Jabez Snow (1696-1760) Estate in Eastham, Mass. deces^d. Said estate Represented Insolvent. Barnstable Ss. By the Hon^e James Otis Esq^r Judge of Probate &c for said County. Comissioners Report & List of Debts hereto Annexed. Massachusetts, Wills and Probate Records, 1635-1991, indexed database with digital images, Ancestry.com (http://www.ancestry.com), Barnstable County, "Probate Records, Vol 17-18, 1769-1783,: Volume 17, page 59 (image 37 of 392), Jabez Snow, 1772/3 Account of Settlement and Dower Dividend. Jabez Snow and Elizabeth Paine (1702-1772) married in 1720 in Eastham, Massachusetts, and resided there for the remainder of their lives. They had six children alive at the time Jabez wrote his will on 31 July 1760. He died on 6 September 1760 and his wife Elizabeth died in 1772. Elizabeth and their six living children were named in the will of Jabez Snow; the only married daughter at the time was Eunice Horting [Horton]. The will and inventory were transcribed in Amanuensis Monday - Post 319: Probate Records of Jabez Snow (1696-1760) of Eastham, Mass. The will is very simple - one third to the wife and the rest bequeathed to the six children. The will of Jabez Snow was proved in the Barnstable Probate Court on 17 March 1761, and the Inventory was filed and approved on 9 May 1761. The probate records in this post were available on Ancestry.com but were not indexed. I recently checked the Probate Index for Barnstable County and found these records that explain a lot more of what happened to the estate. In Amanuensis Monday - 1761 Probate Papers for Jabez Snow (1696-1760) Estate in Eastham, Mass., I transcribed the Dower document, and the widow's one third portion of the real estate was set off by the committee. In the Insolvency Report, the commissioners listed the debts owed by Jabez Snow to his creditors, totaling £282 0s 4d.. In the Account, the executor listed the income collected (£282 5s 6d), including the real estate sold at auction. He also listed the charges, fees and other expenses incurred during his administration (£69 18s 1d). The remaining estate was thus £212 6s 11d payable to the creditors. In the Dividend, the Probate Court Judge ordered that the creditors be paid 15 shillings and 2 pence on the pound (about 75% of that owed) from the remaining estate. Note that the executor sold off the two-thirds of the real estate that was bequeathed by Jabez Snow to his heirs, and charged himself with the personal estate. It is very likely that the executor and his siblings bought at least some of the real property and all of the personal property in order to keep the house lot and other lands in the family. The widow received a portion of the dwelling house and other lands. In the present document, when the wife of Jabez Snow died in 1772, her one-third of the real property had to be sold at auction and the creditors paid up to what they were owed. The sale amount, less the administrator's charges and payments, amounted to £ 88 13s 4p. The Probate Court ordered the administrator to pay off the creditors at the rate of 6 shillings 4 pence to the pound. Thus, the estate file was completed. The creditors took a small loss of the money they were owed by the estate. Jabez and Elizabeth (Paine) Snow are my 6th great-grandparents. Their eldest child, daughter Eunice (Snow) Horton, who married Nathaniel Horton in 1742, is my 5th great-grandmother. Post really provice useful information! Thanks for sharing, nice post! Chúng tôi có các blog rất hữu ích gồm: Blogcothebanchuabiet.com, Bloggiaidap247.com và Giaidap247.com giúp giải đáp thắc mắc nằm mơ thấy rắn, dubai thuộc nước nào và bias là gì rất hữu ích.